The five lights illuminated, and the cars began to zoom past. 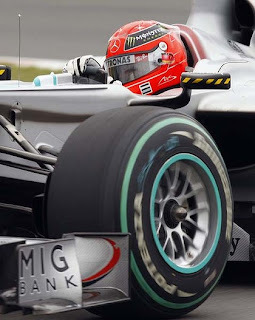 Previously, Michael Schumacher who had vowed the world till 2006, ended up qualifying a dismal 13th! I felt first that the whole race would be a writeoff from Schumi's perspective. But them within the first ten laps, suddenly out of nowhere, the leaderboard said MSC 3rd! For a second, my heart skipped a beat. Could we be seeing a repeat of MSC at Montreal 2004 where he came charging up from 6th to win the race? After a powerful performance at Istanbul a couple of weeks back, where Michael came fourth, I was cautiously hopeful. (Pic cortesy The Age). And then he pitted. I wondered why. Why spoil something that was going fine? But given that Ross Brawn and Michael have had many a winning partnerships till 2006, I said, let's watch. And the the guy who'd made it to 3rd from 13th, began slipping back. And back he slipped, so bad, that he was actually stuck behind any and every available back marker! Well, never mind, he who can climb 10 places in 10 laps can do it again, right? But then came the tiff with Robert Kubica. Over the grass, on the track, wheel to wheel, as close as it can be. The result, a place alright, but at the cost of a punctured front tire. Bad luck indeed. And so, off to the pits again, and after that, while everyone perhaps pitted twice, MSC pitted thrice, and so consistently lost track position. Till the end. Post the race, people commented left, right and center. People said that maybe returning from retirement was not such a good idea. That maybe staying put as 7 time world champion was good. Even Flavio Briatore, wrote him off, saying that he had been away too long to be able to get back into the groove. But if you think about it, that cannot be the case. It takes tremendous drive to charge from 13th to 3rd. It takes even greater motivation to fight for a position like he did with Kubica. It takes tremendous courage to fight it out on track with kids 20 years younger. And it takes a champion to put one's body through that g force, through that heat, and constant stress to be out on a race track. A punctured tire is bad luck. And at Montreal, where everything depended on how best one nurtured his tires, the day just went bad. Besides, who will you blame for machinery, that could not provide sufficient straight line speed to hold on to a position and protect it from a Torro Rosso or a Force India??? It's a Mercedes at the end of the day!!! And it is totally unlike MSC to give up a position, without being totally helpless! Well, whatever the case may be, psychologically, it is definitely very very difficult for a champion of Michael's stature to go through demeaning losses like Montreal. I can somehow see a repeat of the Michael days of 1998 and 1999 with Ferrari. Anyone can almost sense the angst that he might have felt, where being close to the championship, Michael broke his leg at Silverstone in 1999. But a 3 year contract is a long time. And a killer instinct doesn't disappear in 3 years! So even if he doesn't win the championship, I am sure that the learning he can provide to the Merc team is worth millions. He turned around Ferrari by 2000, and I, just like the million other Schumi fans across the world, who still wave that scarlet flag with Michael's face on it believe that one year of teething troubles later, 2011 will be a year to watch out for!